Photo: Coldwater Indian Band Chief Lee Spahan shares his concerns about the new NEB assessment. Canada’s energy regulator is repeating the same mistakes when it comes to the Trans Mountain pipeline expansion, say leaders who are opposed to the project. The National Energy Board (NEB) is redoing its evaluation of Trans Mountain after the Federal Court of Appeal quashed the pipeline’s approval by Canada on Aug. 30. The court ruling came after First Nations representatives along the pipeline route including Tsleil-Waututh and Squamish said the NEB process didn’t properly look at marine impacts and failed to adequately consult them. 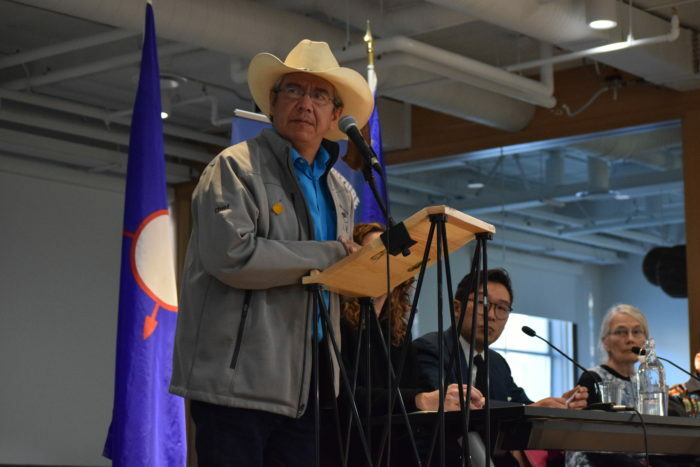 But Indigenous leaders held a press conference on Oct. 23 warning that the new assessment process is just as flawed as the last one and could be grounds for yet another court action. “We’re still here standing up to the flawed system which is the NEB,” said Tsleil-Waututh representative Cedar George-Parker. The federal government has ordered the NEB to review the project’s marine impacts and issue a report before Feb. 22, limiting the geographic scope to 12 nautical miles off B.C.’s coast. But Eugene Kung, a staff lawyer with West Coast Environmental Law, said the scope should actually be 200 nautical miles in order to properly assess the impacts on marine life such as endangered southern resident killer whales. He said the regulatory process has been the “worst” he’s ever seen, and that he is disappointed that the process has not improved. “Even though they have to make a fresh decision they’re doing so on stale evidence,” he said. Squamish Nation Coun. Khelsilem, Vancouver Coun. Jean Swanson, Grand Chief Stewart Phillip of the Union of B.C. Indian Chiefs and Coldwater Indian Band Chief Lee Spahan also spoke about their concerns about the new assessment process. Spahan said the pipeline route goes through key harvesting and ceremonial sites for his nation. “It’s a huge concern to Coldwater,” he said. Phillip said another court action is imminent if the process continues on as it is. “There must be consent all along the pipeline route and as everyone in this room knows there is a deep division,” he said. The Salish Sea Sentinel is published by the Naut’sa mawt Tribal Council, incorporated as a non-profit society in 1983 and governed by a board of directors from our eleven member First Nations located around the Salish Sea. About 6,500 people hold membership in our nations.